It’s been WAY too long since my last post. I have been cooking up a storm, but just can’t seem to find the time to sit down and get all of my thoughts on what I’ve been cooking together. Sometimes life just gets in the way! I have had many people ask me for this recipe so before doing anything tonight I wanted to get this up for everyone to start making their very own Spring Vegetable Lemon Soup w/ Chicken. It’s such a simple soup, but so refreshing & light. It’s the perfect soup for a spring & summer. The lemon juice and fresh vegetables give it such a lovely taste. I got my inspiration from The Cozy Apron’s Lemony Chicken & Spring Veggie Soup w/ Quinoa & Fresh Basil. I haven’t quite figured out how to make things from complete scratch so I always need a little inspiration to help me get started. I like to use other recipes as like an outline. Soups are a great way to add your own little spin on things. It’s so hard to mess up a soup! Feel free to get creative. If there are other veggies you want to add, go for it! I think a little spinach or kale would go great with everything in this soup & might just have to add it next time I make this, which will be soon. 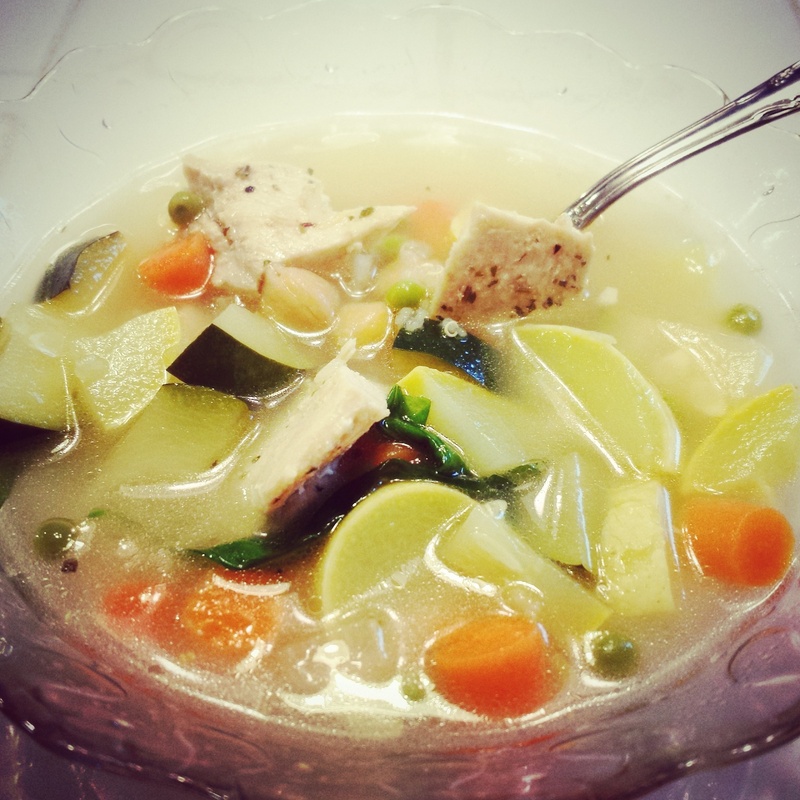 Without further ado, I give you my Spring Vegetable Lemon Soup w/ Chicken recipe below. I hope you all enjoy it as much as I sure did! Preheat oven to 350 degrees Fahrenheit. Place chicken in a baking dish, sprinkle both sides of chicken with Mrs. Dash Lemon Pepper seasoning. Layer sliced lemon slices on top of chicken. Spread sliced shallots around chicken breasts. Fold parchment paper onto top of chicken loosely in baking dish (keeps moisture inside & chicken juicy). Bake for approximately 30-40 minutes depending on thickness of chicken. Once chicken is fully cooked remove from over & cut into bite sized pieces. Set aside until ready to add to soup. Cook 1 Cup quinoa according to directions on box & set aside. Meanwhile, heat butter & oil in large soup pot at medium heat. Once melted add carrots, diced onion & garlic. Let simmer until slightly translucent & garlic becomes aromatic. Sprinkle w/ Mrs. Dash Lemon Pepper seasoning & stir to combine. Add chicken broth, cover & bring to a simmer, medium/low heat worked best for me. While chicken broth is heating up, begin slicing up your vegetables & adding them to the pot along with the chickpeas. Let simmer for approximately 25 minutes before adding the peas, chicken & cooked quinoa to soup. Once peas, diced chicken & quinoa is added to the soup add the lemon zest & juice. Stir. Taste to see if any salt/pepper needs to be added. Add accordingly until you reach your preferred taste. Cover & simmer for another 5-10 minutes until everything is at an even temperature. Scoop from the bottom to be sure your getting a little bit of everything & ENJOY!